Mumbai, May 2014: This summer bid adieu to dry, dehydrated skin and uneven skin tone! 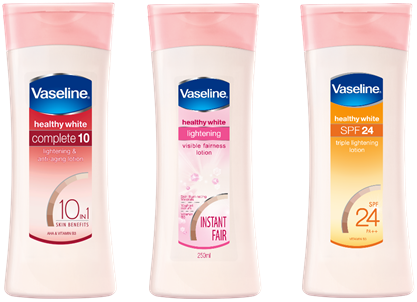 Vaseline gives you the three options to nourish, moisturize and lighten your skin with Vaseline Healthy White Lightening Lotion, Vaseline Healthy White Complete 10 and Vaseline Healthy White SPF 24 Triple Lightening. Power-packed with micro-droplets of petroleum jelly, Vaseline Healthy White range of body lotions have all you need to pamper and protect your skin from the harmful effects of the scorching sun. During summers, a key concern for most women is, tanned and dull looking skin which makes them look older. The overall body skin also tends to lose its ability to develop new skin cells and as a result it appears dull and lacks luster. The Vaseline Healthy White body lotion range, with its restoring power, is all you need to curb these skin problems. Vaseline Healthy White Lightening Lotion: Built on the advanced Optics Technology, Vaseline Healthy White Lightening Lotion provides an instant visual benefit from depositing pigments (Titanium dioxide and Red Iron Oxide) for a lighter, more even toned skin appearance. It effectively goes into three different layers of the epidermis leaving your skin lighter and 4 times* fairer instantly. Vaseline has always believed in introducing products that feel and do good to the skin. Over the years, it continues to seamlessly deliver this with its thoughtfully chosen ingredients and its ability to nourish, enrich and restore skin. The right combination of some of the best skincare ingredients, Vaseline Healthy White body lotions range is sure to be your best pick for skincare regime this summer. Vaseline Healthy White Complete 10: This latest and enhanced Vaseline Healthy White Complete 10 body lotion comes with Triple Sunscreens that protect your skin from the damage of harmful UVA and UVB rays of the sun and prevents it from further tanning and damage. It also contains anti-oxidants that guard your skin against fine lines. Other chief components include CLA which helps in reducing dark spots, AHA that boosts moisture and elasticity in the skin, and Vitamin B3 which aids skin lightening process. Vaseline Healthy White SPF 24 Triple Lightening: Enriched with Vitamin B3, this body lotion gives you protection that helps keep skin fair and even toned. The formula gets instantly lapped up by the skin to give it a soft feel. The Vaseline Healthy White SPF 24 Triple Lightening not only protects you from the harsh rays of the sun but also helps make your skin look even toned and fair! About Hindustan Unilever Limited: Hindustan Unilever Limited (HUL) is India's largest Fast Moving Consumer Goods Company, touching the lives of two out of three Indians. The company meets every day needs for nutrition, hygiene and personal care with brands that help people feel good, look good and get more out of life. I wish I can all the three different types over here. Gosh, want to try so badly. I'm using this product especially the one with SPF... I love it... I keep on buying it..